The Khaki Campbell is a breed of domesticated duck that originated in England and is kept for its high level of egg production. 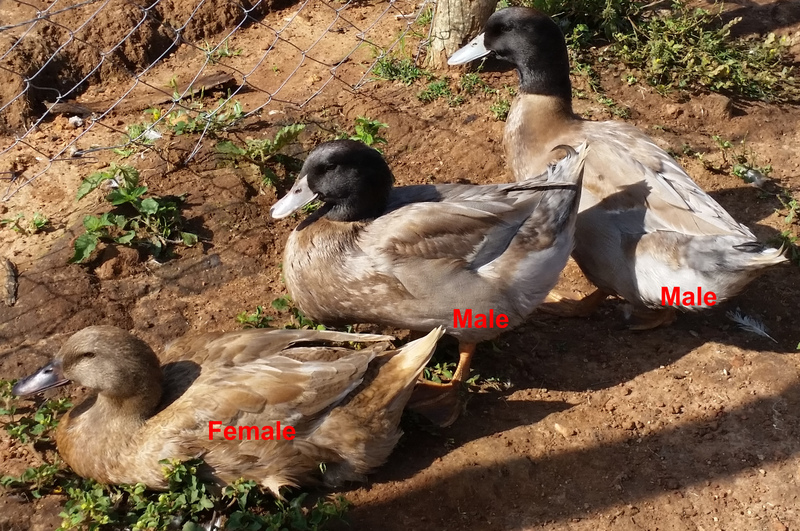 Adult Campbell ducks weigh approximately 1.5 – 2.3kgs. Campbells can come in three colour varieties: khaki, dark and white. They are a cross between Mallard, Rouen and Runner ducks. The egg production of the Campbell breed can exceed even the most efficient of egg laying domestic chickens, with the breed laying an average of 325 eggs a year. When provided a moderate “duck conscious” environment to live in they will lay a more than modest number of eggs per week. Khaki Campbells become mature at approximately 7 months. Khaki Campbell ducks seldom hatch out others’ young; however, in very communal situations do hatch large broods together. Incubators or broody chickens are used to hatch out Khaki Campbell ducklings. Incubation takes approximately 23 to 28 days for a Khaki Campbell duckling to hatch. Drake (male): Head, neck, stern and wing bar: bronze, brown shade preferred to green bronze. Rest of body: an even shade of warm khaki. Legs and feet: dark orange. Bill: green, the darker the better. Duck (female): Khaki colour all over, ground as even as possible. Back & wings: laced with an even shade of khaki. Lighter feathers on the wing bar allowable. Bill: greenish black. Legs and feet: as near body colour as possible. Head: plain khaki, streak from the eye considered a fault. Campbells are remarkable ducks. They are alert, sprightly birds which in some strains produce over 300 eggs per year. Their white eggs weigh about 2.5 ounces. They are hardy foragers, always busily looking for slugs, snails and worms. They love water – but manage to stay in good condition even when water is only in buckets and bowls. However, like all ducks, their feathers do stay in best waterproof condition when they have bathing water. The Khaki Campbell is one of the more famous and popular duck breeds due to its excellent egg production. It was introduced in 1901 by Mrs. Adele Campbell of Gloucestershire, England. She experimented with Runners crossed with Rouen and Mallards. Initially they were a fairly mixed colour breed but later an emphasis was placed on the current khaki colour. The Khaki Campbell gained popularity due to the egg laying contests where it averaged up to 39 more eggs laid than the second best breed. One Khaki Campbell laid 346 eggs in 365 days while another laid one egg a day for 225 straight days! Ziwani Poultry has visited a lot on farms in England where we buy show quality fertile eggs from various farms in the UK for our own breeding stock.